Insure that you and your family will be satisfied with your new Deck or addition after construction is complete by using our advanced computer planning and modeling tools. Our unique software program will allow you to see your finished project before construction begins. And if you need more information? See the top 5 reasons to choose TimberTech composite decking and learn how TimberTech can save you time and money in the long run compared to traditional wood decks. Watch this video What is TimberTech? 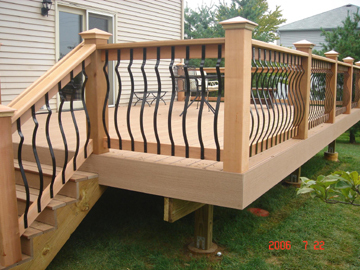 TimberTech® is a leading manufacturer of low-maintenance, high quality composite Decking and Railing Solutions. Made from reclaimed wood fibers and pure plastic resins, TimberTech® composite decking and railing is a revolutionary alternative to traditional wood decks that offers a skid-free, splinter-free surface that doesn't need painted, stained or sealed. Does TimberTech® have a warranty? Yes. TimberTech® warrants to the original consumer purchaser that, for a period of twenty-five (25) years from the date of original consumer purchase, under normal use and service conditions, TimberTech® Decking and Railing shall be free from material defects in workmanship and materials, and shall not check, split, splinter, rot or suffer structural damage from termites or fungal decay. Does TimberTech® Decking come in any colors? TimberTech® Floorizon, TwinFinish and 2x6 Planks come in Cedar, Grey and Redwood. TimberTech® Earthwood Planks come in Tropical Rosewood, Tropical Teak and Tropical Walnut. TimberTech®'s5/4 Plank is available in Grey only. Does TimberTech® Railing come in colors? Yes.TimberTech®'s Ornamental Rail System is available in Cedar, Grey, Redwood and Whitesand. TimberTech® RadianceRail comes in a Coastal White and Classic Black. Will TimberTech® Decking and Railing colors fade? Yes. Most materials exposed to UV and weathering will fade. TimberTech® decking and railing solutions are blended with high-quality raw material and UV-inhibiting pigments to produce products consistent in color. Because of the quality of material used, most TimberTech® decking and railing products fade less than other composites available. What effect does heat have on TimberTech® products? The effect that heat has on TimberTech® products is similar to the effect it has on a wood deck. All TimberTech® colors were developed with reflective, inorganic pigments which are more expensive than organic pigments, but dramatically reduce heat build-up. Some competitors use organic pigment due to the cost of the reflective, inorganic pigments. TimberTech®'s R&D engineers have been developing pigment systems for vinyl siding for over 50 years, providing the expertise for TimberTech to have one of the coolest composites available. Is fiberon® a privately held company? How large of a company is fiberon® ? Fiber Composites, LLC, makes fiberon® composite deck products and is the second-largest manufacturer of composite decking and railing in North America. Does fiberon® have a hidden fastener system available? Yes. The hidden deck fastener system is designed specifically for fiberon® Professional GV and fiberon® Tropics GV deck boards. How many colors is fiberon® decking available in? Six: Mahogany, Jatoba, Redwood, Cedar, Gray, and Brown. What type of plastic does fiberon® use in its composite decking? Many decking companies use mixed density resins. These plastics are typically used in less structural types of plastics like bags and wrappers. fiberon® uses High Density Polyethylene (HDPE). HDPE resins are typically found in more rigid products like drinking cups and food packaging. The use of HDPE results in a decking board that is stiffer, more durable and much harder than other decks made with inferior grades of plastic. What type of wood flour does fiberon® use in its composite decking? fiberon® wood flour contains premium maple products. Maple contains less tannin than oak and other hardwoods typically used by other composite manufacturers. 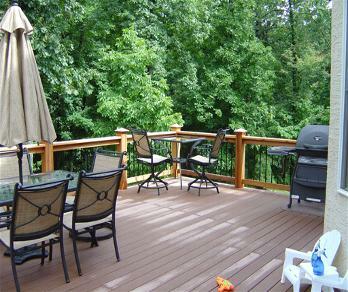 Composite decks that use wood products high in tannin are more likely to develop unsightly stains. fiberon® maple composites are less likely to show these stains and keep your deck looking great year after year. 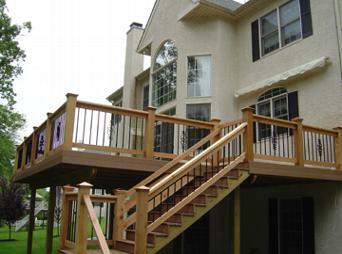 Does fiberon® produce anything other than decking and railing products? 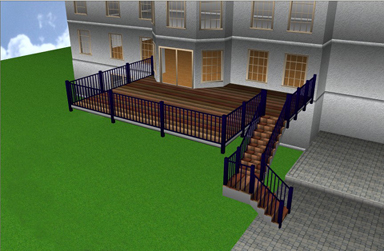 fiberon® produces composite decking and railing and fencing. What is EverGrain® made of? EverGrain is made of a combination of plastic and wood fibers and contains recycled material content. What makes EverGrain® different from traditional wood? EverGrain® decks are built with composite decking material created through a unique compression molding process. Unlike wood, these composite materials withstand the test of time and absorb very little moisture - without painting or weather proofing. EverGrain® railing is made of the same durable composite wood materials as EverGrain® decking and does not require staining or painting. Does EverGrain® come with a warranty? Yes. EverGrain® has a 25-year limited warranty. Will EverGrain® wood fiber on the surface deteriorate? EverGrain® wood fiber is encapsulated in plastic and deterioration will be minor. However, color will lighten slightly. Will termites damage EverGrainV decking? EverGrain decking is warranted against termite damage when installed according to manufacturer's instructions. EverGrain® decking exceeds the slip-resistance recommendation set forth in the ADA accessibility guidelines.